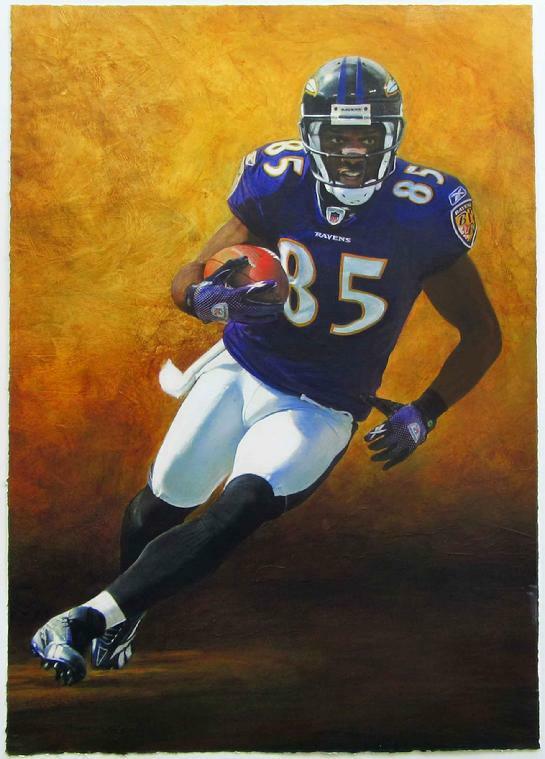 Beginning in 2004 Stacey Carter was commissioned by the NFL team Baltimore Ravens to create a series of portraits of the team’s star players for their new state-of-the-art training facility in Ownings Mills, MD. 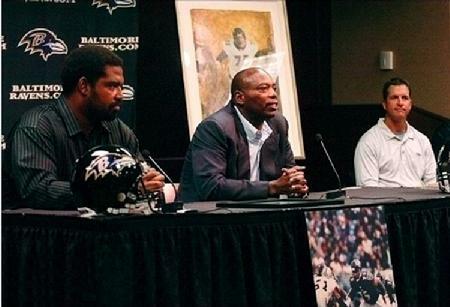 The portrait series are installed in the executive office level of the training facility Players included are: Ray Lewis, Jonathan Ogden, Peter Boulware, Ed Reed, Chris McAllister, Matt Stover and Todd Heap. Former Raven’s players include: Mike McCrary, Jermaine Lewis, Rod Woodson and Tony Suragusa. In addition to the player portraits, Carter was also commissioned to create a painting of the Raven’s winning Super Bowl team from 2000. The mixed media painting on canvas measures 48 x 54”, and is installed in the team’s executive conference room in Ownings Mills. Jonathan Ogden Announces His Retirement from the NFL. Ravens LT Jonathan Ogden announces his retirement from the NFL after 12 seasons and 11 Pro Bowls. Original photographs courtesy Ravens photographer Phil Hoffman.